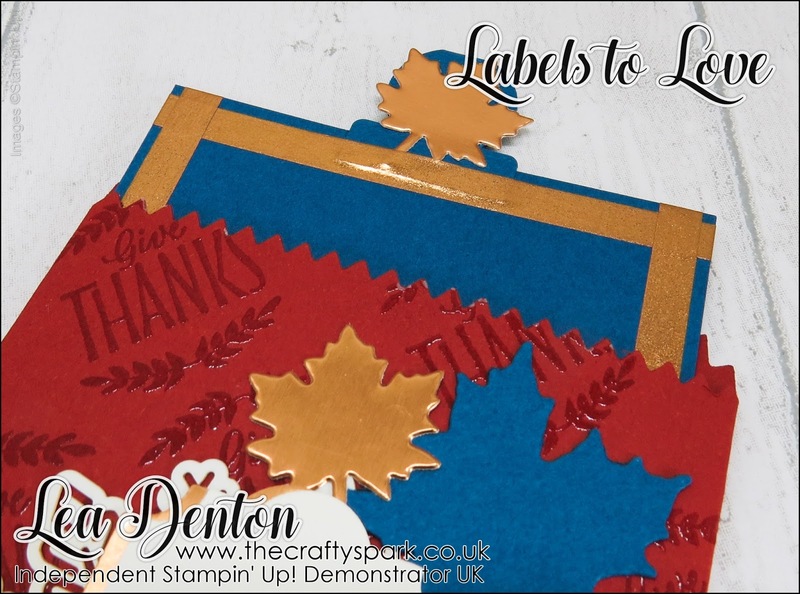 Welcome to another Stamping Sunday Blog Hop :) This month the Stamping Sunday Design Team are showcasing the amazingly versatile Labels to Love Stamp Set which is one of the new sets in the Autumn/Winter Catalogue 2017. As always we have some wonderful projects to show you and as an added superduper treat this month we are totally over the moon to have Mary Deatherage hopping with us as our special guest! You are currently at the blog of Lea Denton in the UK (just in case you get lost!) and when you get to the bottom of the photos you'll find the links to the other Design Team members taking part this month. Labels to Love. Labels. To. Love. Labels labels labels.... I just LOVE labels! Really does appeal to my inner nerd :) Have you seen this set yet? It is SO versatile and goes with just about any occasion you need. Just because they are labels, don't let that stop you using the Labels to Love Stamp Set anywhere you like. 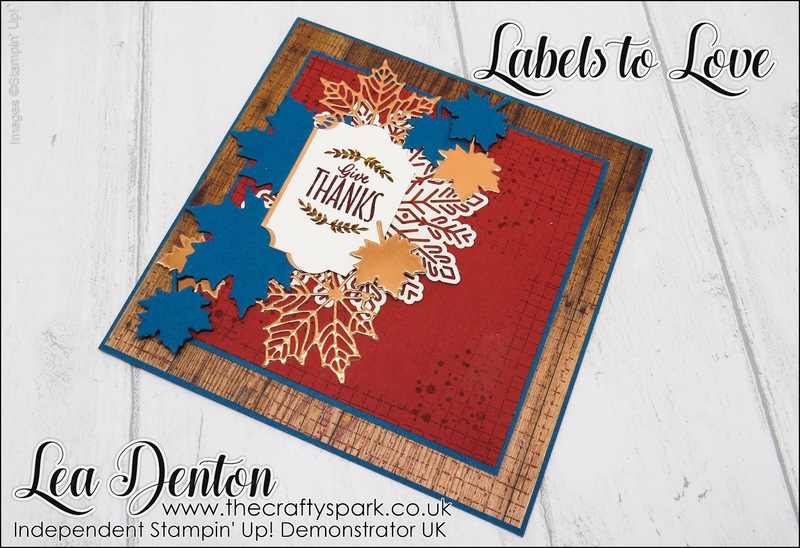 For my project this week I've taken the leaf design from the Give Thanks stamp in the set and matched it to some of the die cut leaves from the Seasonal Layers Thinlits Dies. Gives a wonderful Autumnal feel to the whole set don't you think especially with the rusty coloured Cajun Craze cardstock and Copper Foil. 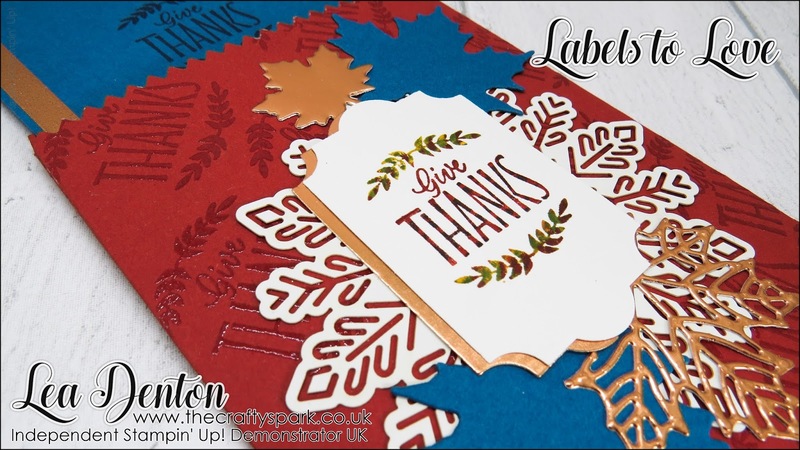 Before I die cut the bag I stamped the 'Give Thanks' sentiment at an angle and used some clear embossing powder to create a subtle background. Attach a gift card to the pull out tabbed card in the Mini Treat Bag and you have a great way to present your gift. To go with the Mini Treat Bag gift card holder is of course a matching card. Very similar in design just with some wood patterned paper from the Wood Textures Designer Series Paper pack. I used the new Everyday Label Punch to punch out the 'Give Thanks' on both card and bag. 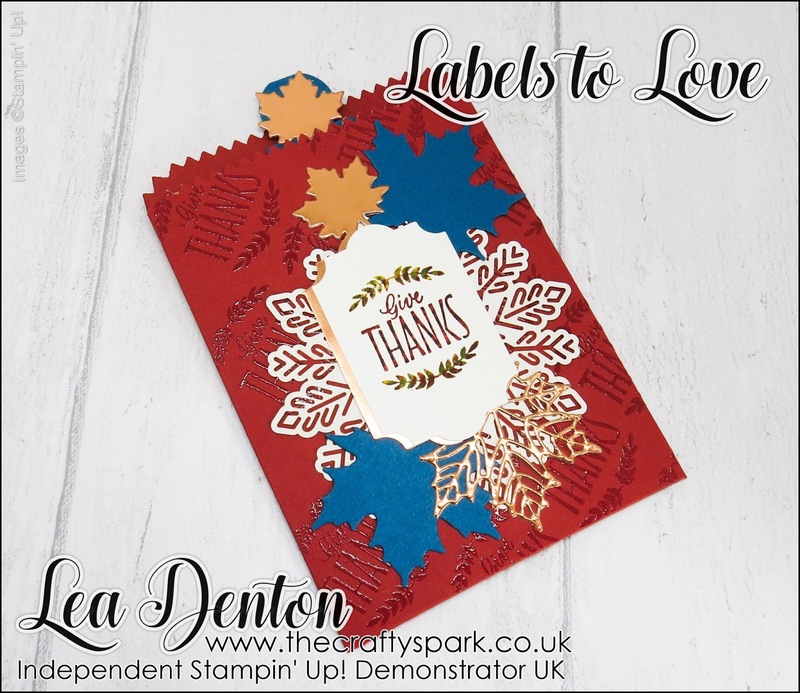 Brilliant punch to add to your collection and as well as coordinating brilliantly with the Labels to Love Stamp Set it can be used with the Merry Little Labels Stamp Set (punch and stamp set also available as a bundle with 10% discount off the price!). See the doilies... they are actually Foil Snowflakes turned over. Thank you once again for visiting the Stampin Sunday Blog Hop. Don't forget to continue scrolling down so you can click the links of the other Design Team Members that are taking part in the blog hop. Lea ~ stunning Fall card and coordinating gift bag! The all over stamping/embossing on the gift bag really takes it a whole new level. Lea! Beautiful projects! I have tried turning over the snowflakes to get the neutral look. Fab tip. Beautiful projects with blue on them.. Never thought of that with Fall, but it looks great Lea!